The Redzone: Does a mild card weekend mean we need more or less playoff teams? Roger Goodell wants more teams in the postseason, but is it a good idea? Does the NFL need to change its playoff structure? Those are the words of NFL Commissioner Roger Goodell in April of last year when asked about the possibility of increasing the number of playoff teams. For an organisation that traditionally embraces change — just look at the new extra point and kick off rules — the NFL has been quite conservative when it comes to tinkering with the structure of the playoffs. Indeed, the last time they expanded the postseason came all the way back in 1990, when the league jumped from 10 teams to 12. The reason Goodell was asked about increasing the number of teams in the playoffs is because all four divisional winners lost in the Wild Card round last season and, so the theory goes, adding more teams would increase the chaos. The most likely new format would see 14 teams make the playoffs. Here’s what this year would look like if 14 teams made it. The biggest change is that, obviously, only one team gets a bye for Wild Card Weekend and that presents some interesting match-ups. The Chiefs lost to the Titans on December 18 and the Bucs and Falcons split their NFC South series so carnage could possibly ensue. It increases the ‘risk’ that a team with a losing record during the regular season could win the Super Bowl but it does add to the chaos. Plus, the risk is small as, over the past decade, no seventh seed has finished worse than .500 with more than 75% ending the season with a winning record. The other option though, maybe the better one, is to reduce the number of playoff teams, with either just one Wild Card team or none at all. I’ve already written about how the NFL should just scrap divisional winners having an automatic playoff place though I’m all too aware of how karma has kicked my arse given what team dispatched the Oakland Raiders this weekend. But, the fact is, any reduction in teams going to the postseason would almost certainly have to coincide with the loss of an automatic playoff berth for divisional champions. Now, imagine Derek Carr’s leg didn’t break and how exciting does that look? Whatever happens, we can only hope next weekend’s Divisional Round is more exciting than the snoozefest served up over the past 72 hours. What would you like to see the NFL do with their playoffs? Let us know why in the comments section below. 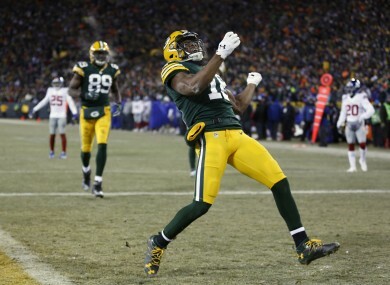 Is it time to rename the ‘Hail Mary’ the ‘Aaron Rodgers’ after he nails another one? Email “The Redzone: Does a mild card weekend mean we need more or less playoff teams?”. Feedback on “The Redzone: Does a mild card weekend mean we need more or less playoff teams?”.